Contact us by email or telephone in the first instance. 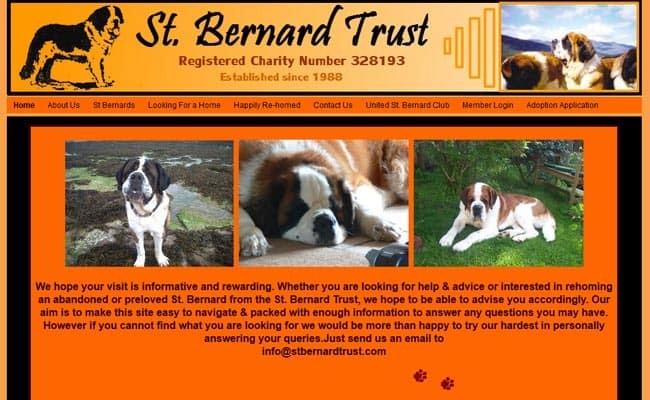 St. Bernard Trust – The St. Bernard Trust is a registered animal welfare charity dedicated to rescuing and rehoming unwanted and often neglected St. Bernard. We work closely with our dogs in order for them to feel safe and regain trust and confidence, as well as tailoring the individual dogs needs to the prospective adopting family. The St Bernard Trust does not sell dogs, but requests an adoption fee from new owners in order to continue rescuing and rehoming. We get dogs of all backgrounds, whether they’ve been abandoned abused or have outgrown their welcome, and aim to find the ideal home for each individual. Re-homing a St.Bernard is very rewarding but you must be committed and adaptable to the individual dogs needs. If you’re serious about re-homing a St.Bernard, please do some research to make sure they’re the right breed for you and your family before thinking about applying to adopt one.